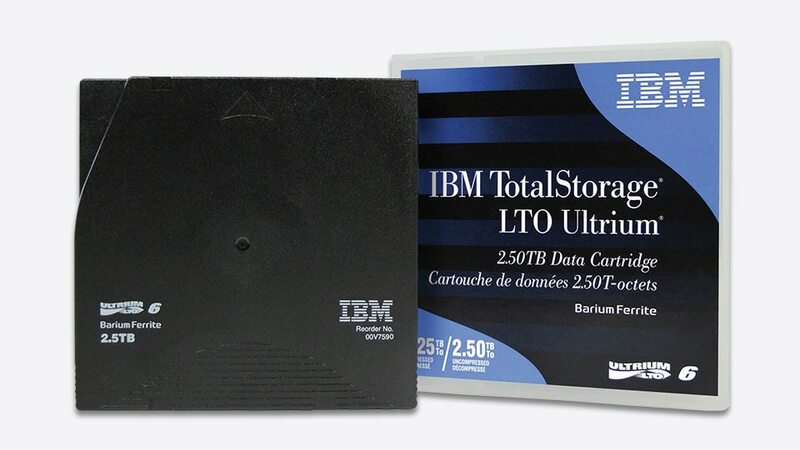 The IBM LTO Ultrium 6 Data Cartridge is designed to help you manage explosive data growth, sustain rapid, reliable access to data and ensure business resilience. The sixth generation of LTO Ultrium tape media delivers 2.5 TB native capacity and up to 6.25 TB of compressed capacity for even greater efficiency and performance. This exceptional capacity helps reduce the number of cartridges and the amount of equipment, space and labor associated with tape-based data storage. Reduce cartridges and the amount of equipment, space and labor associated with tape-based data storage with 2.5 TB native cartridge capacity and up to 6.25 TB capacity with 2.5:1 data compression. Facilitate remote, offline data storage for superior protection from natural or man-made threats with tape cartridge portability. Search and retrieve data files with directory tree and drag-and-drop, reduce or eliminate software licensing costs and dependencies for data retrieval from tape with IBM Spectrum Archive support. Adhere to Linear Tape-Open (LTO) Ultrium 6 standard for compatibility with LTO Ultrium 6 vendors’ tape drive and automation product. Reduce investment risk with open standards-based tape technology.